Ernest H. Polak (*1921-†2005) was born in Amersfoort, The Netherlands. He grew up in The Netherlands, where he was involved with the family business Polak's Frutal Works (PFW), a highly successful flavour and fragrance company. He moved to the USA in 1939 where he joined PFW Inc in Middletown, NY, USA. In 1944, after doing a Master of Science in Chemistry at the University of Iowa, he joined Hoffman LaRoche in New Jersey as a researcher. He then returned to PFW Inc in 1948 where he was Vice President for Research and Development until 1973. In 1975, Ernest and his wife Ghislaine moved to Paris, France, and from then on he fostered his wide interests in chemoreception through a host of academic contacts and collaborations. 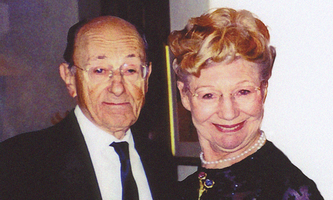 In autumn 2004, Ernest and Ghislaine Polak made a large endowment to ECRO and AChemS, established as "The Elsje Werner-Polak Memorial Fund in memory of our niece, gassed by the Nazis in 1944 at age 7." • Other similar purposes such as outward reach.